1. Why consider a 2 × 2 × 2 model? (i) Although it provides a rough and ready explanation why Portuguese might export wine and Colombians export coffee, the Ricardian model is overly simplistic. Simplistic, because labor is assumed the only factor of production and the production process is linear. In the real world, there are other factors, such as capital, land, and natural resources that are used in production. (ii) The US imports cars even though we produce them. The Ricardian model does not explain this. (iii) Although it is possible to consider a general model with many factors of production and many outputs, at least for the purpose of this course, it would be useful to consider a model with two factors and two goods, and to relax the restrictive assumption that production process is linear. The purpose of this chapter is to demonstrate that there are gains from trade even when a country does not specialize in only one good but produces many goods. In other words, a country benefit from trade when it is cheaper to import a product than to produce it in the home market using domestic resources. Emperor Justinian in Turian purple. St. Vitaly, Ravenna. Belisarius on left, Bishop Maximianus on the right. (iii) Tyrian purple . It costs about €2000 or $2500 per gram or $70,000 per ounce. It is 60 times more expensive than gold ($1200/oz). and 40 grams are required to dye a handkerchief ($100,000) A purple toga would have cost $50 million. 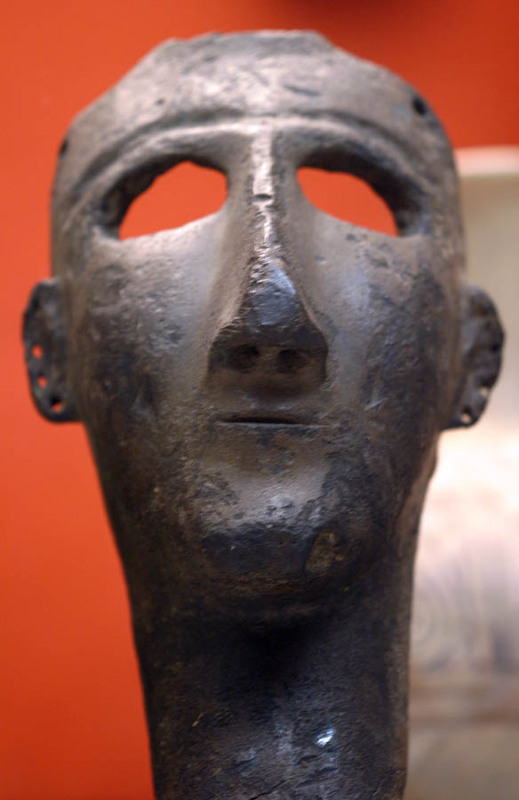 A Phoenician mask. 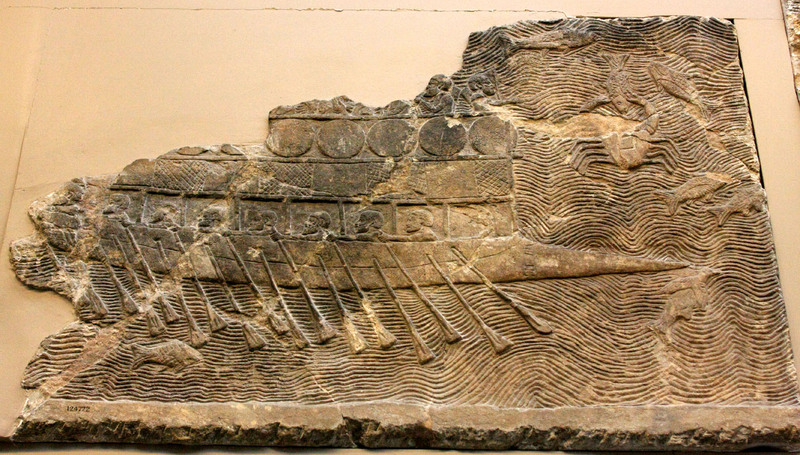 Phoenicians and Philistines were a sea faring people, i.e., they were the first maritime traders. Phoenicians were known for glass and purple dye, which was made from a sea snail, murex. (its habitat was the coast of Lebanon and Syria now.) They also traded slaves captured on the lands they traveled. Phoenicians were the descendants of the original Canaanite inhabitants. As other groups (e.g., Israelites and Philistines) moved in, they were ousted to the edge and migrated to coastal cities. 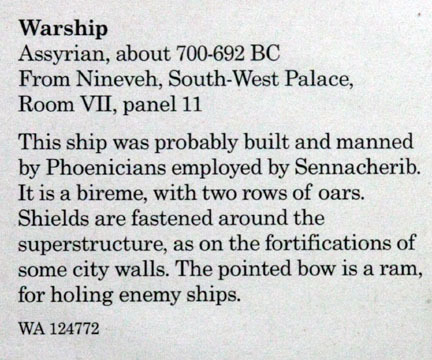 Phoenicians built coastal city of Tyre around 2750 BC. The Tyrian purple was highly valued by European royalties. (Dyed textiles and glass were their main exports.) An inscription of Rameses III at Medina Habu recorded that the sea people included Peleset (Philistines), Lukka (Lycians) and Denyen (Danaen Greeks). They may have included Teresh (Greek name for Etruscans). They also invented the alphabet of 22 letters. They also taught slavery and crucifixion to the Romans. Toga candida (white toga): those running for government offices. ⇒ candidate. To get more of one good, give up something else. (ii) PPF is concave ⇒ increasing opportunity cost. The amount of y2 that an economy has to sacrifice to get an additional unit of y1 increases as y1 increases. Example: If demand for oil increases, the amount of other goods to sacrifice to get an additional barrel of oil increases. Technologically efficient production All Points along the PPF. Allocatively efficient production Only one point, where MRT = MRS.
A: Allocatively efficient. depends on price. Allocative efficiency implies technological efficiency, but not conversely. PPF: is the locus of maximum output combinations from given resources and technology. When does the PPF shift? (i) An increase in the supply of an input. discovery of new oil reserve. How does unemployment affect the PPF? Unemployment causes only an inward movement to a point inside the PPF. (ii) x1 = y1, x2 = y2 (Production = consumption for each good). Also, in a closed economy, production = consumption at the market prices. subject to: yi = Fi(Li,Ki). This condition must hold for every firm using capital and labor, regardless of the output they produce. C = wL + rK. 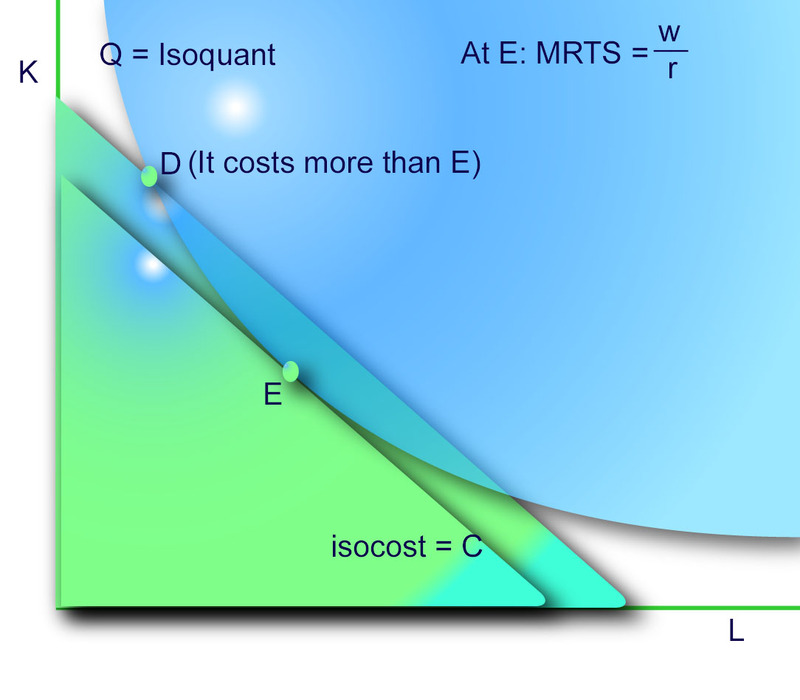 where C/r is the vertical intercept and - (w/r) is the slope of the isocost curve. The negative sign indicates that an isocost curve is negatively sloped. K1 = C1/r - (w/r)L1. K2 = C2/r - (w/r)L2. MRTS ≡ (defined as) MPL/MPK = w/r in equilibrium for each good j. 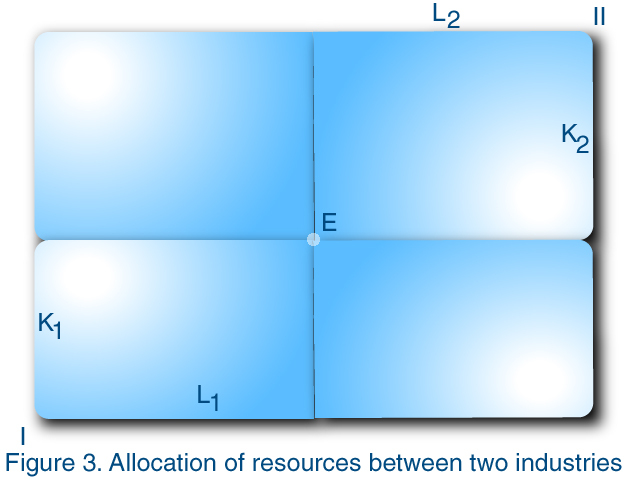 Arbitrary Resource allocation between two industries How does an economy allocate resources? MRTS must be the same (= w/r) for all goods using the two inputs, K and L.
Figure 3. An arbitrary allocation (E) of resources between two industries. MRTS = w/r for every industry using capital and labor. This is shown in the Edgeworth box diagram. Along the contract curve OABO', the output of industry 1 rises while that of industry 2 declines, which yields the production possibility frontier. (ii) laissez-faire (nonintervention) policy: By letting the market maximize profits. Production and consumption decisions are decentralized, and relegated to numerous producers and consumers. If the central planner were an omnicient (all-knowing) deity directing all aspects of production and consumption, this equivalence can be restored. Q: If an AI (artificial ingelligence) planner orchestrated production and consumption, can such a totalitarian society (such as China) do better than the Free Market? A: It remains to be seen. Information asymmetry occurs between government and private agents, and AI cannot acquire full information. Data collection from private producers and consumers is difficult. In fact, data gathered in a totalitarian society is not reliable because they are often exaggerated. Thus, information assymetry can cause government failure. Wars are caused by information asymmetry, i.e., each side overestimates the probability that it will win. Nonequivalence (Empirical Reality) The communist experiment of the former Soviet Union for the period 1917 - 1991 clearly demonstrated that central planning in practice cannot do better than the laissez-faire policy. China still insists on central planning. In a free market economy, production decisions are decentralized. Individual firms make production decisions. There are about 30 million firms in the US (2012). Πi = piyi - wLi - rKi. Industry 1: Π1 = p1y1 - wL1 - rK1. Industry 2: Π2 = p2y2 - wL2 - rK2. Π = p1y1 + p2y2 - w(L1 + L2) - r(K1 + K2). K1 + K2 = Ko. (aggregate demand for capital = fixed aggregate supply of capital). Π = p1y1 + p2y2 - (wLo + rKo). Implications of undirected, unorchestrated decentralized decisions Notice, however, that fixed supplies of inputs are fixed (by assumption). Factor prices, w and r, are endogenously determined. However, in equilibrium, these factor prices can be treated as fixed parameters, at least in the eyes of competitive firms. In a free market millions of undirected firms make production decisions, which collectively maximize the country's GDP. We now consider an equivalent problem. A central planner makes production decisions. Equilibrium condition Equilibrium condition: MRT = p1/p2Isorevenue curve is defined in the output space, i.e., it is the locus of outputs along which revenue remains the same. Since prices are fixed, isorevenue curves are straight lines. The same locus when defined in the consumption space is called the budget line. s.t. GDP = p1x1 + p2x2. Efficient output mix and efficient consumption bundles depend on prices. In general, supply rises with the price, whereas market demand declines as price rises. (Law of demand). If demand ≠ supply, then the market does not clear. Thus, we need to find the equilibrium price at which demand = supply for each good. How does one find the equilibrium price, p1/p2 ? In practice, free market impersonally determines the equilibrium price. 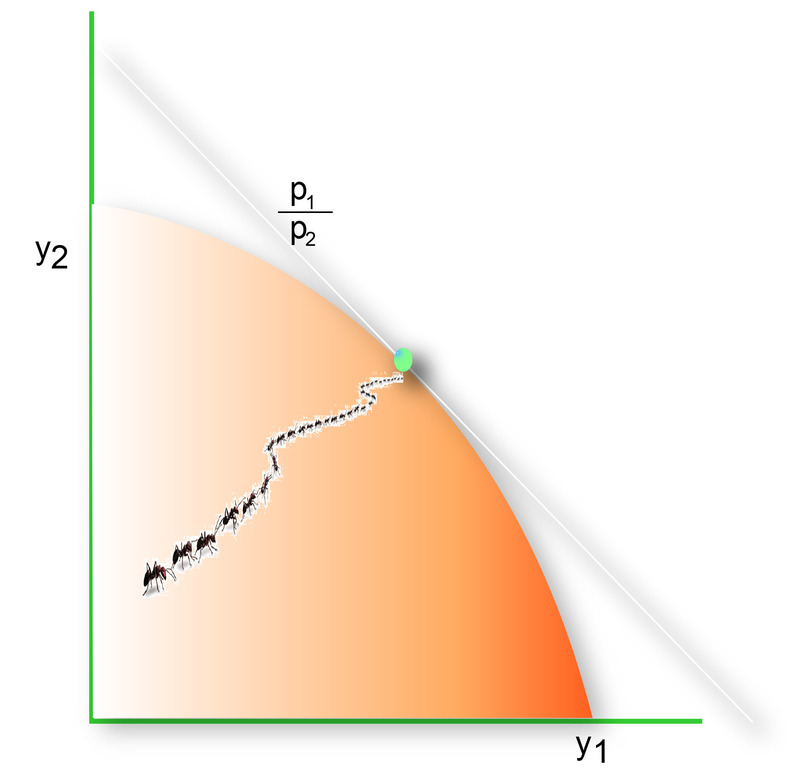 Mathematically, it is the slope of the separating hyperplane that separates the highest indifference curve and PPF. Impose the condition: production = consumption for each good. 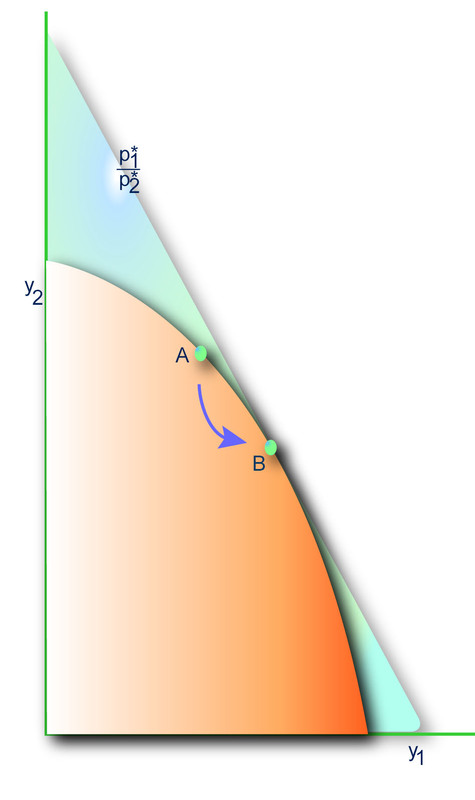 Once equilibrium is established in a closed economy, it is possible to draw a separating hyperplane through the equilibrum point that separates the indifference curve and the PPF. 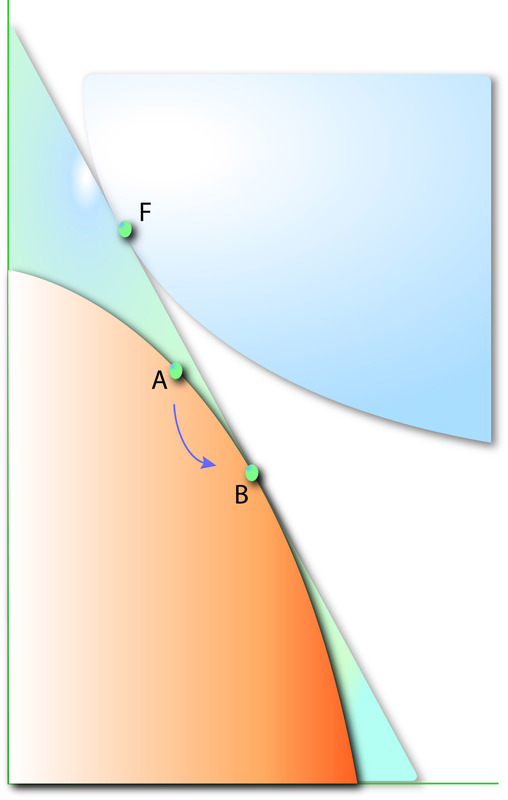 In a two-good world, the separating hyperplane is a straight line. In a three-good world, it will not be a line, but a three-dimensional plane. 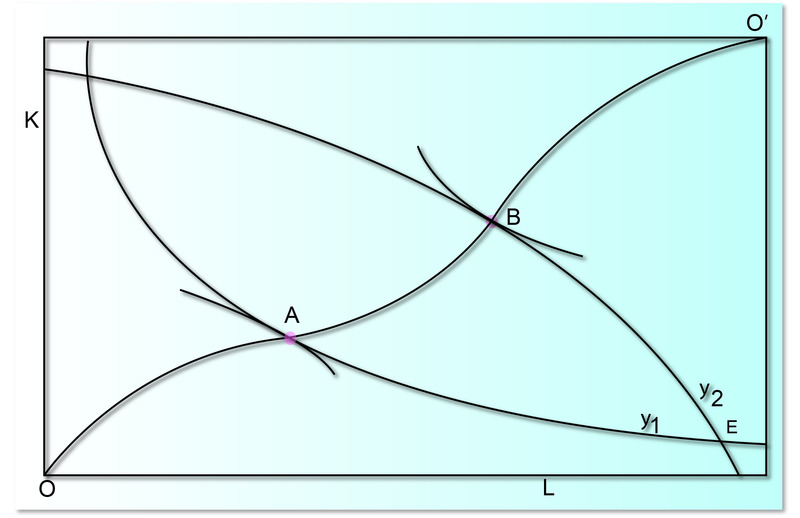 In a many-good world where the number of goods exceeds three, one cannot employ a two- or three-dimensional graph, but algebra can be employed, and an algebraic expression can be obtained describing the equilibrium prices in a closed economy. Such expression defines a multi-dimensional hyperplane separting the PPF and indifference surface. 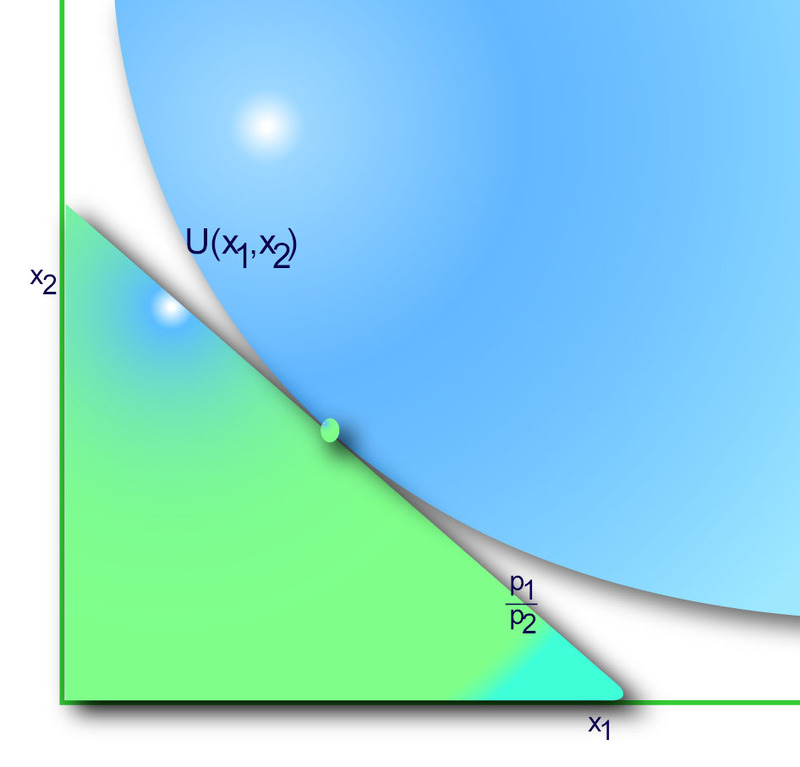 At any rate, the separating hyperplane defines the autarky equilibrium prices in the domestic market. (i) Central planner: computes pA, directs each firm and person to engage in the production of certain commodities. Mathematically, the two methods are equivalent and yield the same answer. In practice, market economy is better because it preserves individual incentives and economic freedom. The command economies of the former Soviet Union failed. This does not mean market economies are free of problems. (i) PPF: F(y1,y2,K,L) = 0. (Don't worry about zero in the above equation. Undoubtedly, this is a complex problem with four unknown decision variables. However, we will break it up into two stages, so we deal with two decision variable problem in each stage. 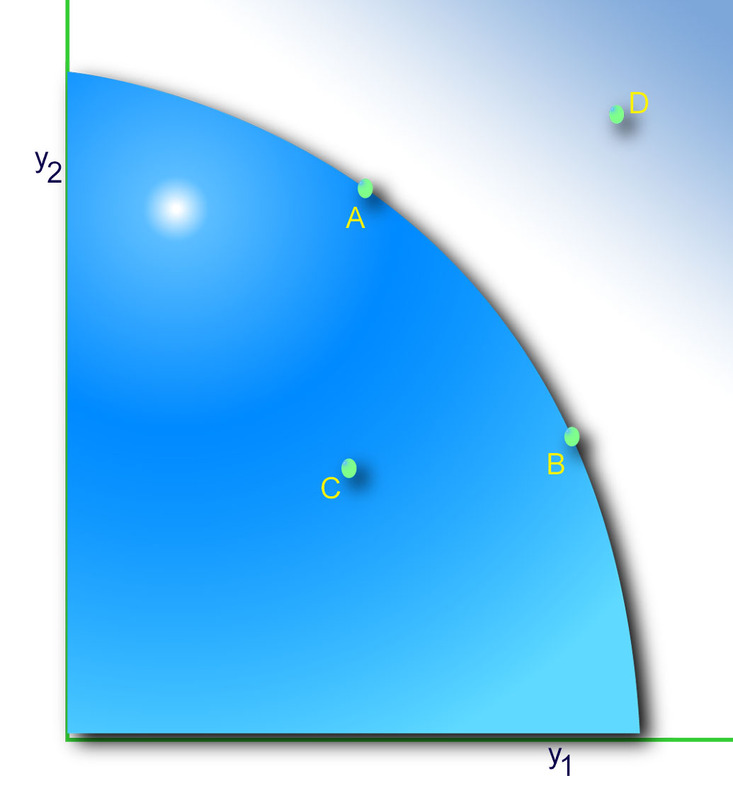 subject to: y2 = f(y1,L,K). 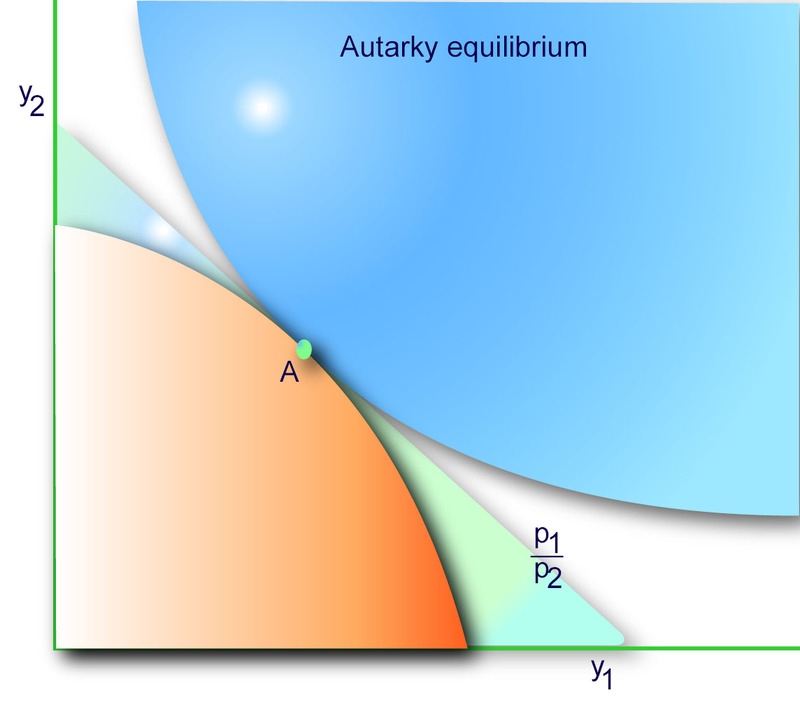 Producers move from the autarky point, A, to the free trade production point, B.
Equilibrium condition MRT = p*1/p*2. Remark: B (free trade production) maximizes GDP at p*1/p*2, but A does not. Io = p*1x1 + p*2x2, where Io = p*1y1 + p*2y2 = maximized income. In other words, choose a bundle (F) on the budget constraint so that it is tangent to the highest indifference curve. Remark: F (free trade consumption) was not feasible before. Trade Triangle: BFC in Figure 10. 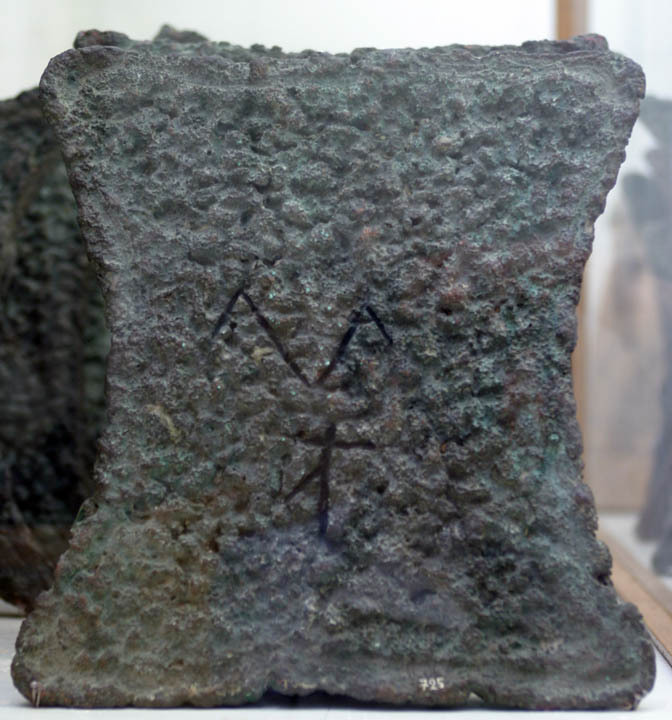 Copper ingot from Crete. Copper was alloyed with tin to produce bronze during the Bronze Age in Cyprus, and exported far and wide.